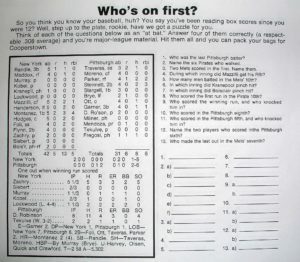 Question #10 – Who scored in the Pittsburgh 8th? Answer – Remembering that Milner was one of the 6 Pirates that walked (doing so, leading off for Robinson in the 8th), means that the runner to cross the plate in the 8th inning was Mendoza, who took Milner’s place as a pinch runner. It was the only time that he was on the bases, and the only run the Pirates scored in the 8th inning.